This item is not eligible for Amazon Prime, but over a million other items are. Join Amazon Prime today. Already a member? Sign in . blouses Click to check for reviews and special offers. pants The best customer experience and products, here at Amazon.com! skirts Free Super Saver Shipping on qualified orders over $25. purses Free Super Saver Shipping on qualified orders over $25. dvd recorder Shop at Amazon.com for low prices. Simon St. Laurent's foray into XML is best described by an adjective not often used with computer books: charming. From its portable size to its playful code examples, XML: A Primer is an interesting and well-crafted read. Stylistic considerations aside, it is also a useful introduction for anyone who does considerable work in HTML or SGML. St. Laurent explains the nuanced differences between XML and HTML, stating, "Using XML requires a different focus, demanding that designers examine the way that their documents are built rather than the way they are formatted." He later comments, "XML doesn't go nearly as far as SGML in requiring conformance to standards, but it may still come as a shock to HTML developers. XML standards refer to processors (parsers), not to browsers, because much XML development will be intended for machine-readable data applications rather than graphically exciting web pages." 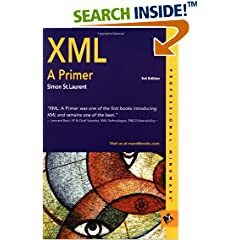 If you are curious about the hype surrounding XML, ready for an XML book you can read cover to cover, and comfortable with lengthy code examples, XML: A Primer will offer you the knowledge you need to understand this emerging technology. --This text refers to an out of print or unavailable edition of this title. XML looks to be a big advancement over HTML. As St. Laurent writes, "Using XML requires a different focus, demanding that designers examine the way that their documents are built rather than the way they are formatted." Microsoft Internet Explorer 4.0 already offers some support for XML, and Netscape 5.0 will support XML. This book is geared to the HTML developer who wants to move to the next level of web design and not wait for Microsoft or Netscape to develop the tags and style support they need. A primer rather than a complete guide to XML, this is a great starting point. Copyright 1998 Reed Business Information, Inc.--This text refers to an out of print or unavailable edition of this title. Average Customer Review: based on 27 reviews. I think my title says it all. This book was very helpful to me and it should be for anyone looking for an introduction and a little history on XML. It starts out very basic though, and moves sloooowly up the knowlege ladder. I was tired of it quickly and found myself skipping chapters to get 'just the facts please'. If you know nothing about XML and need an intro, you may want this book but I would look around for others as well. This lacks hard-core examples. I first read this book a few years ago, and still read excerpts from it periodically as friends get involved. In one of the early chapters, St Laurent basically asserts that WYSIWYG was actually a technological setback. I knew at that point I was going to enjoy the book. If you're into computer science, and want to understand the technology - this is a great place to start. I'm a web developer who knows both HTML and CSS. I bought this book wondering what the world of XML could be about. I was told that it was the "future" of the internet or something. I browsed some online tutorials, and found that this was not just some simple language you could learn in a couple weeks. As I opened the book, I started reading the introduction. The beginning of the book is very interesting because St. Laurent gets into much detail about where XML came from and the roots of practically every language it derived from (like C). But as I read on into the book, he was very wordy. this book needed a CD-ROM with it. The language itself is very simple. But there are many rules that you must follow. To a typical, experienced developer his language is probably most understandable. As I was reading about DTDs n such (i had to read it over a bzillion times) I got even more confused. Finally, I just decided to put it down. His explanations were NOT in layman's terms so the curious user could understand. True, he did give lengthy explanations, but it could be because I read it all during school in small snippets. I never tried out his onlione stuff he has pasted all over the book. What I'm saying is I don't think this book is for curious new users. Maybe users thatr understand all the basic stuff, then just wanna use it as a reference or be told why exactly something does something. A user said earlier that he doesn't leave the reader guessing random code. Well, if you flip thru the back, you can see that the lengthy code pages offer tiny explanations. The IS a ton of code pages. Just thought I'd point that out. I would not recommend this book to anyone. The cheapest is not always the best. It's February 2001, and this book still does a better job of explaining what XML is all about than ones with a 2001 copyright date. St. Laurent's understanding of a Primer is right on target. Instead of having tons of code for the reader to cluelessly hammer out, he explains how XML works, and so when the reader does code the examples, he understands far better what's going on. The explanation of the Document Object Model is unmatched in any of the other books published on XML. Likewise, the crucial topic of Document Type Definitions (DTD) is handled far better and in intelligent detail than anything published since. Unfortunately, XML is deceptively complex. While it doesn't take a rocket scientist to crank up an XML file, toss in some CSS and claim XML is yet another programming language one has conquered, understanding how the DTD works requires more than a couple of examples and a reassuring pat on the shoulder that the reader can do it in an afternoon. What St. Laurent does, and does well, is to prepare the serious developer/programmer for understanding XML. To be sure, the book represents a foundation for using XML and is not an entire treatise on all that XML can do. However, unlike some of the books I've seen on XML that contain code that will not validate (including on their CD ROMs), this book gets it right. If you want to get XML right, this book is the place to start. Data organization is XML's strength, making it an excellent mechanism for transfering information from one application to another -- whether it is a database, a legacy system, or a web site. Strangely, the author never really gets the point across. This book is the worst technical book I've ever purchased. If it were feasible, I'd give it negative stars. If you are interested in learning AND using XML's capabilities, check out David Hunter's "Beginning XML". Compare the table of contents. You'll see the difference. Some people appear to really like this book. It has received many glowing reviews, but I can only shake my head in disagreement. This book is a dud -- too much text, and not enough practical advise or code examples. The author could not adequately describe how to use basic XML components such as Document Type Definitions (DTDs), and failed to show how Cascading Style Sheets (CSS) can be used to display XML on the web. XML, look elsewhere. This is not the book for you. In fact, I'm selling this book. Wanna buy it? I'll use the proceeds to purchase "Beginning XML" by Kurt Cagle. That book looks promising. Be a Web Designer and Macromedia Expert...: by mindwarper, "Idiot Savant"